Flowers are an iconic part of a romantic gesture for a reason – they’re beautiful. So, why not use them to secure a date for prom? You can incorporate blooms in a number of ways. 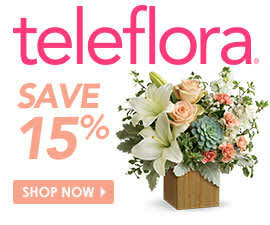 For instance, have a bouquet, like Teleflora’s Dance With Me Bouquet, delivered to your crush’s class at a set time. Include a note with a poem, your question, or even just compliments. Maybe you want to add a twist like this to a classic poem: “Roses are red, violets are blue, I think you’re amazing. I want to dance with you.” If you want to be a little more mysterious, tell your crush to meet you somewhere after classes. Wait there with a sign. If the apple of your eye is into games, design a prom proposal that incorporates his/her favorite one. Get creative with how you ask. Does your crush fill out the morning crossword during first period every day or spend weekends mastering the newest board game? If you use this information, your crush will get to do something he/she loves and will unlock an awesome surprise at the end. For instance, you can make your own word search that includes “Will you go to prom with me?” in the mix or take a photo of yourself holding a sign asking and have it made into a puzzle. You can even make your own board game that highlights all of the reasons you like this person or why he or she should go with you. Just have fun with it! Looking for a relaxed but unexpected way to ask your crush to prom? Make Netflix your wing man. Invite your crush over for a movie night during which you can put on your favorite movie with a prom proposal scene. Then when the characters on screen pop the question, you can get up and do it yourself. Have a sign and flowers ready for the big moment. Seal the deal with Teleflora’s Pretty Please Bouquet; charm with your good manners. If you’re nervous, or you want to throw your crush off, make the movie night a group activity. Just let your friends know what’s happening beforehand so that they don’t accidentally interrupt the moment. Going big might be more of your thing. In that case, gather your friends or teammates and get ready to make a scene. During your school’s next big sporting event, assembly or play, have your group stand up in the audience each holding signs that spell out “Will you go to prom with me?” Consider adding your crush’s name to the mix so there’s no confusion. Of course, talk to the principal or teacher coordinating the event beforehand, so you can get permission and work out a good spot in the show, game, etc. to insert your promposal. This idea is especially fun for a student who is involved in the event. Imagine your crush is taking a bow at the end of the play he/she just performed in and looks into the audience to see your sign? Hard to beat a night like that! No matter what creative idea you go with, make sure it’s one that’s personal to you and your crush. Think about his/her interests and incorporate them into the best promposal you can create. Good luck!